Habit: Perennial herb, rosetted when young, forming large patches from woody caudices and rhizomes, minutely strigose (some hairs also longer). Stem: weakly ascending to erect, 1--5 dm. Leaf: cauline 2.5--8 cm, oblanceolate to +- elliptic, +- entire to wavy-lobed. Inflorescence: flowers in distal axils; stem tip nodding. Flower: hypanthium 10--23 mm; sepals 15--30 mm, free tips in bud 1--4 mm; petals 25--40 mm, white fading pink or rose-purple. Fruit: 10--25 mm, widening upward (to 3--5 mm), 8-ribbed; stalk-like base (4)8--15 mm, 1.5--2 mm wide, cylindric. 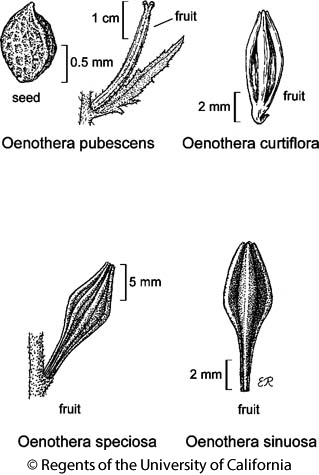 Seed: clustered in each chamber, 1--1.5 mm, obliquely oblanceolate, finely granular-papillate. Chromosomes: 2n=14,28,42. Ecology: Disturbed places; Elevation: generally < 500 m. Bioregional Distribution: SCo; Distribution Outside California: native New Mexico to central United States, central Mexico. Flowering Time: May--Sep Note: Commonly cultivated, doubtfully naturalized; cross-pollinated. Citation for this treatment: Warren L. Wagner 2017, Oenothera speciosa, in Jepson Flora Project (eds.) Jepson eFlora, Revision 5, http://ucjeps.berkeley.edu/eflora/eflora_display.php?tid=35050, accessed on April 23, 2019. No expert verified images found for Oenothera speciosa.